Ballistic gelatin testing is one of the best methods we have available today for predicting the real-world performance of self-defense ammunition. We’ve used Clear Ballistics synthetic gelatin to test over 150 handgun loads, including Remington 102 Grain. We fired 5 rounds into the gel with a four-layer cloth barrier to determine whether heavy clothing would affect the penetration and expansion characteristics of the bullet. 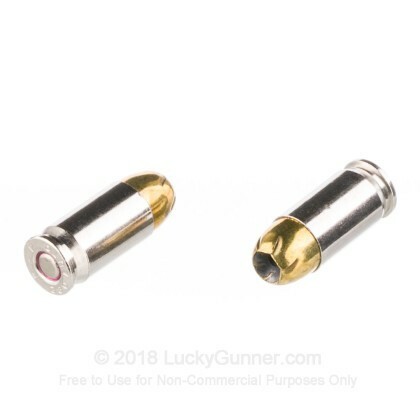 All rounds were fired from a Glock 42 to reflect the type of short barreled compact pistols that are most commonly carried by legally armed citizens. 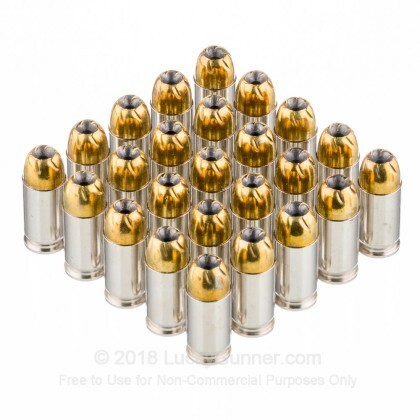 Above, you can find photos of the actual bullets suspended in the test medium. Images of the recovered bullets are below on the left and high-speed footage of the first bullet fired into the gel is below on the right. 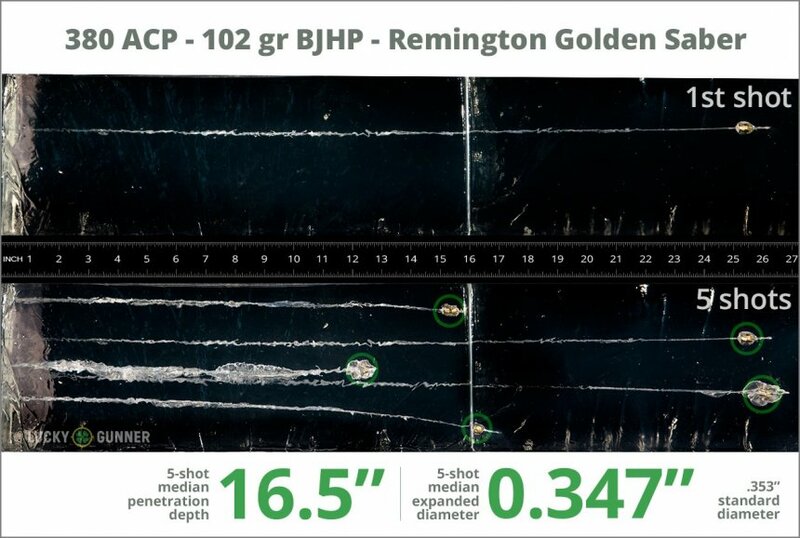 All of the data we collected from our test of Remington 102 Grain is in the chart below that along with diagrams that might give you an idea of how this load compares to other .380 Auto (ACP) products. 16.5" 0" 6.5" 13.3" 28.7" This ammo: 16.5" Min: 6.5" Median: 13.3" Max: 28.7"
I've used My Colt .380 for over 30 Years without a JAM or Misfire. 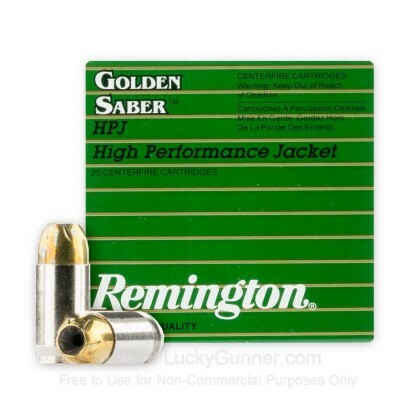 And the AMMO it likes the BEST is the REMINGTON GOLDEN SABER !!! The Golden Saber cost more to Shoot - But, You should practice with what You CARRY. WHEN YOUR LIFE DEPENDS ON WHAT'S IN YOUR GUN - YOU GET WHAT YOU PAY FOR !!! IS YOUR LIFE WORTH 40 CENTS A ROUND ??? 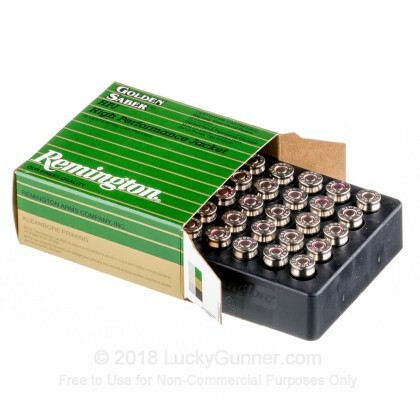 This ammunition comes highly recommend by Ruger for my LCP II. I use it as a backup self defense with excellent results. At this price it's a steal. I got a 5 shot mean average in my LCP of 896 FPS, which is decent energy, but in water jugs it didn't expand at all and lost it's jacket. 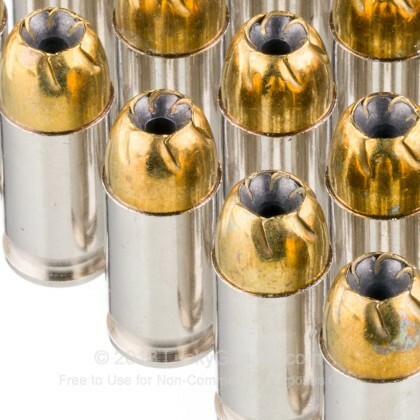 These rounds performed admirably in my Bersa Thunder 380. Extremely satisfied. Just had time to run a few clips through my glock 42, was impressed with ammo plan on going back to range again today. Will purchase more in future. The Golden Saber is a good round for carry, but they do exceptionally well in longer barrel firearms. I have tested them in .40 S&W and the expansion is impressive. They perform as advertised and in a Bersa .380 with the 3.5 inch barrel they do well too, but I would not recommend them for pocket guns with very short barrels due to the possibility of lack of expansion, but in most circumstances these do perform flawlessly in most firearms. 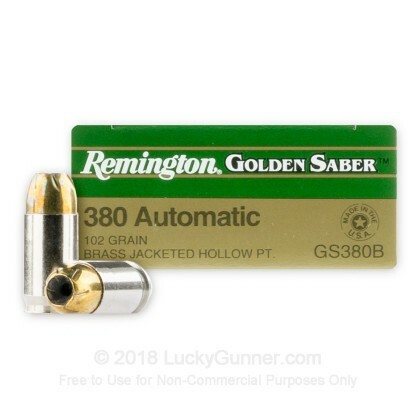 We also have this 380 Auto - 102 Grain JHP - Remington Golden Saber - 25 Rounds ammo in stock in a smaller quantity.